Cocoa Beach FL, out and back on the beach, sunny and 80 F. Figured I could walk the first 12 miles and run the rest, but the sand turned soft about where I started running. Ended up walking half of the last 6 miles too. Sunny and 74 F. Beach conditions change each year, and this year the first 8 miles of sand was soft. Pain in hip flexor and knee. Started 5 minutes late. 1/4 mile track, Titusville FL. Late again, by 1 hour. I registered day of race and found they changed the starting time. Right hamstring and arch were sore, which I later traced to worn shoes. I didn't notice during the race but it was obvious the next time I wore them. The ascent climbs 13.4 miles from Colorado Springs at 6280 ft. to Pikes Peak at 14,110 ft on trail. The marathon is the next day, out and back (actually 26.3 miles, which makes it an ultra). I spent a week in Colorado mostly at 6000-8000 ft, so I was not well acclimated to the altitude. I had a headache after the ascent and a wet cough for 2 hours after the marathon, early signs of pulmonary edema. On the way down in the marathon, I stopped to pull a sharp stone out of my shoe only to discover there was no stone but a half-dollar size blister on my heel that had popped. Key Largo to Key West FL on the narrow shoulder of a busy highway. It was 68 F, 100% humidity at night, 80's and sunny the next day. Started at 5 PM with a 31 hour cutoff. I dropped at noon at the 100 km aid station with swollen feet that made even a slow walk extremely painful. An hour later I was fine. Only 25 of 55 finished, and the race was never held again. Quitting, admitting failure, was the hardest thing I had done. A DNF gets no mention in the results. I had to turn in my race number, the one that I would have added to my collection for every race I had ever run since my first 5K in 1986. I was determined to try again. Ran barefoot and got huge blood blisters on my toes. Palm Bay FL, 1/4 mile track, sunny, 88 F, humid. Dehydrated and down 5 pounds even though urine was clear and frequent. Problem was salt depletion. Went home for 8 hours, recovered, ran 16 miles in last 3 hours. Mostly mountain trails in Colorado at 9200-12,600 ft, good weather. Pushed hard to make the 50 mile turnaround cutoff of 14 hours by 2 minutes, then had nothing left. 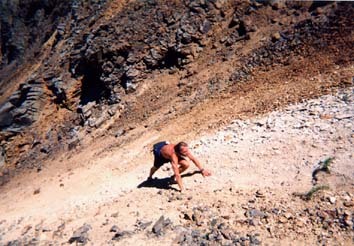 On the return climb up Hope Pass (2600 ft. in 2 miles) I climbed 100 feet, sat down, and refused to go on. There was nothing physically wrong. The next day it felt as if nothing had happened. ...and decided on 6 oz. Mizuno XC racing flats with hard soles and rubber spikes. Big mistake on a rocky course. Both ankles were swollen after 20 miles, could not run after 50, then hip flexor inflamed. Dropped at 70 miles after 21 1/2 hours. Rained all day. Good recovery. Ran a 3:37 marathon next week. Barefoot again, but with tape on toes to prevent blisters. Really works the calves. Sarasota FL, absolutely flat grassy trail. 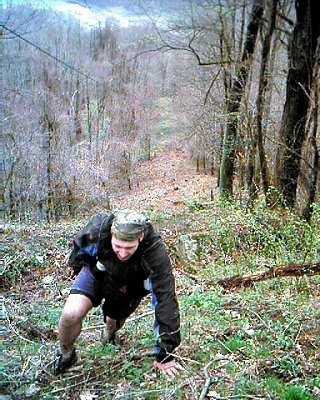 Frozen Head TN, incredibly tough, unmarked 20 mile loop, no aid, no markings, 10,000 ft. of climb per loop, unmaintained wooded trail, sawbriers, many 50% grades and sections without trail and terrible footing. Ran first loop in 11:40, then had 29:45 at 40 miles, missing the 26:40 cutoff. The 60 miler had 39 starters and 6 finishers under the 40 hour cutoff. Mark Williams of England became the first in the 10 year history of the race to finsh the 100, in 59:28. 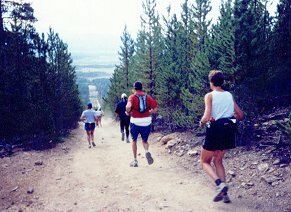 75 miles of dirt roads, 25 of trail, run in conjunction with a 100 mile horse race. 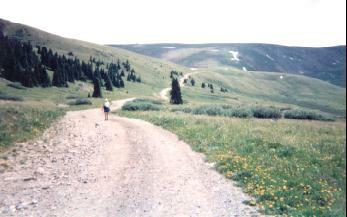 Very scenic, rural area, 14,000 ft. of rolling hills, 65-85 F. Quads stiff for about 4 days afterwards. Rain, 45-50 F, only 40% finished. Spent 2 weeks in CO and climbed 5 14,000 ft. peaks, so I was ready for the altitude. Blisters on backs of both heels caused trouble in last 25 miles, but surprisingly very little muscle stiffness afterwards. Anterior tibialis inflamed after 40 miles. Took 12X recommended dose of ibuprophin and was limping for 10 days after race. Great food though, didn't use drop bags. Ran a 10K race 90 minutes earlier, then ran the beach race in aqua socks. 40's F and rain. No finishers in 100, only 2 of 24 finished 60 including Mark Williams. Made 30 miles in 23 hours, dropped with sore achilles, caused by overextending it climbing Little Hell, 1500 ft. in 0.6 miles. On my first attempt at Barkley and having read about its history, I had little expectation of finishing. This year was different, and I thought I could do it. Oh, how quickly we forget. The Barkley doesn't care how tough or determined you think you are, it just whittles away at your will until nothing is left. 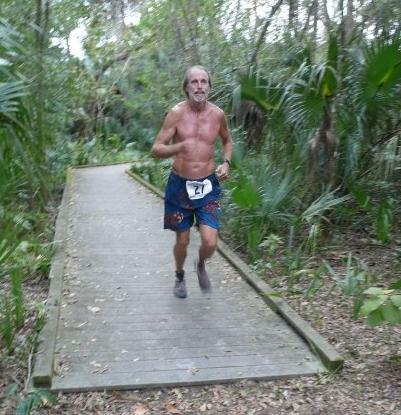 Inspired by Barkley, I designed this trail course myself, though I was unable to find any hills in Melbourne Florida. Temps over 90 F. No finishers in the 50, and only 2 of 9 finished the marathon. Gary (Barkley RD) would be proud. I set the marathon course record of 7:33, then dropped after 33 miles (in 9:40) after everyone else went home. Caught giardia after drinking out of streams and treating the water with year-old iodine tablets that had turned black. At least I had the symptoms; I didn't see a doctor. Giardia is an intestinal parasite that interferes with fat digestion, kind of like eating Olestra. Lots of gas and diahrrea for a couple of weeks. 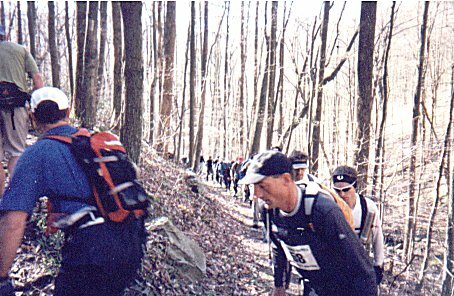 Laural Highlands is a point to point trail in western Pennsylvania, hilly, 4 aid stations, crew required in case you DNF (40% do) and need a ride. Gerry Wales crewed for me. Officially there were 4 starters and 1 finisher (Frozen Ed) on this jeep trail loop at 8000-12,600 ft. Dave Cooper and his 8 year old son Lane and I deliberatly detoured up Handies Peak (14,048 ft) and hitched a ride back. Usually Pikes Peak and Leadville are the same weekend, so I took advantage of a rare opportunity. I was well acclimated after a week of hiking portions of the Hardrock 100 course at 10,000-14,000 ft. I was surprised to have muscle soreness afterwards in my hamstrings instead of my quads. Good weather, 50% finished. Lane paced me for 24 miles after his father DNF'ed. Made the 86 mile cutoff by 1 minute. I included this since I ran a combined 33 miles. My wife Joan and I entered the Ironman-length race as a relay, with me swmming 2.4 miles and running the marathon while she biked 112 miles in between. During her bike ride I raced the Mini-Floridian - swim 1 mile, bike 30, run 7. I did not recover very well from this and ran the marathon in about 5 hours. Nevertheless, we still won first place coed-masters-relay (out of 1). It also did not help that I broke a finger the day before the race and swam 3.4 miles with a splint on my right pinky made of coat hanger wire and tape that kept falling apart in the water. Still wearing that stupid splint. Slowest ever. Had a cold, stomach cramps, diahrrea. At least my finger was OK.
20 miles in 10:45. What else can I say? 8:02 marathon and still feeling good after 41 miles, but ran out of time. Silverton, Colorado, 9300 ft. Enormously difficult, 33,000 feet of climb, average elevation over 11,000 feet, 48 hour cutoff. 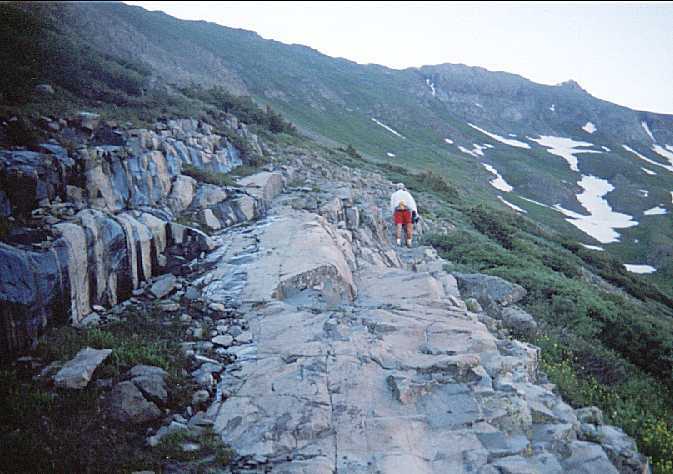 Portions were off-trail across tundra, rocks, or snow, treacherous in some places where a slip could send you sliding hundreds of feet. 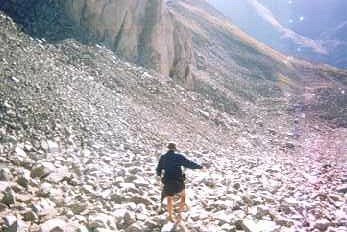 There were places where you climbed with your hands or descended with ropes, or would glissade down 1000 feet of snow sloped at 30-45 degrees. 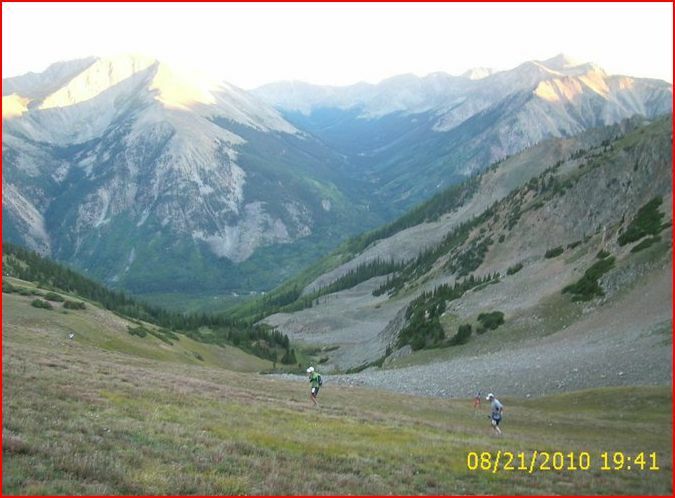 I got lost descending Virginius pass (13,000 ft) after dark when the trail markings disappeared and arrived at Governor's Basin (35 miles) 30 minutes after the 16:45 cutoff. Ran to Ouray (42 mi) and got a ride back. The next afternoon I paced Mark "Barkley 100" Williams the last 9 miles to a 39:30 finish. 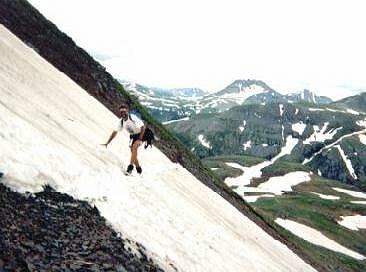 Leadville, Colorado, 10,000 to 13,500 ft, trails, including a 200 ft. glissade over a roped snow cornice at 13,500 ft in a thunderstorm and near-freezing rain. Missed a cutoff at 70 miles. After 2 weeks in Florida and 5 days re-acclimation, there was just enough fluid buildup in my lungs so that I could not get enough air to make the high altitude climbs fast enough. 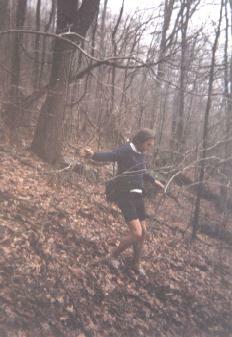 Other than that, I wasn't in any worse shape than on the years I finished. Steep, rugged, but well maintained point-to-point trail along the north shore of Lake Superior, Minnesota, with spectacular cliffside views of the fall foliage. No crew, pacer, drop bags, or socks. Ran hard after 2'nd dawn but got lost 200 yards from the finish with 6 minutes left to get the 30 hour gold buckle. ARRRGH! My wife Joan biked the 112 miles while I swam 2.4 miles (1:43) and ran the marathon (3:47) for the Iron Couple. Total time was 13:32. Our original swimmer got sick so I did it with a total of 7000 yards of training for the entire year. We won second place coed masters relay team. Steady rain. Ran mostly in 2 oz. beach slippers and 5-6 miles barefoot. Missed the 40 mile cutoff of 26:40, ran 29:33. 20 miles of snow at the start, 90's at the finish. 100 miles in 51:38. On pace until I got lost in the mountains at 93 miles with 4 hours to go until the 48 hour cutoff, but went nowhere for 3 hours. The trail I had trained on last week looked completely new after sleeping 10 minutes the first night and none the second night. Just one missing marker was all it took. Ran without crew, pacer, drop bags, or socks. Same aquajoggers, but took them off and ran barefoot for miles 9 to 22. My first 50 miler (really). Flat, soft trail, partly wooded, 80 deg. Changed shoes every 13 miles: Nike's, Teva-style sandals, racing flats, and barefoot for the last 10 miles. Joan ran the 50K in 10:22. Ran first 26 miles in sandals (3:49) and last 5 barefoot. Joan ran in 8:59 and we walked the last 10 miles together after I finished and recovered a bit. 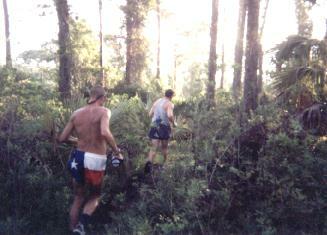 The next day we biked 90 miles around Pinellas County on mountain bikes. The day before the 50K, I ran a 5K and Joan a 10K. Nice shaded trail, low 70's. 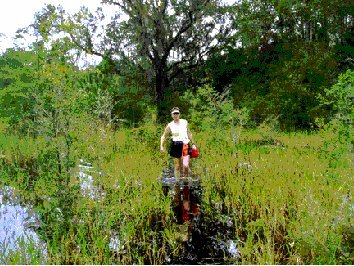 A 5 mile out and back and 3 15 mile loops on part of the Croom 50K course in the Withlacoochee S.F. near Brooksville. Ran first 35 in new Montrail Vitesse trail shoes, but I thought they were too heavy so I ran the last 15 mile loop in sandals. My 15 mile loop splits were 3:09, 3:11, 2:28. On the last loop I moved from 30'th to 14'th out of 35 starters and 28 finishers. Ran 40 miles in 28:07, a course PR if you can call it that. (The cutoff is 26:40). Good weather, 58 to 82 F and sunny, but everyone from up north thought it was too hot and humid. Never got my feet wet. Montrails with socks were a bad idea on the hills; I kept twisting my ankles and started to blister until I took the socks off. Second loop was in Nikes without socks. The 60 mile fun run had 3 of 33 finishers within the 40 hour cutoff. Tough trail, very rocky, but well marked with good food at the aid stations. No crew, pacer, or drop bags. Ran in Montrails without socks. Quads stiff and feet swollen. Had to walk by second afternoon, even downhill. 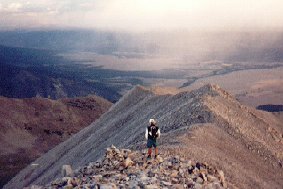 Climbs 13,100 ft. Wheeler's Peak, highest point in New Mexico. 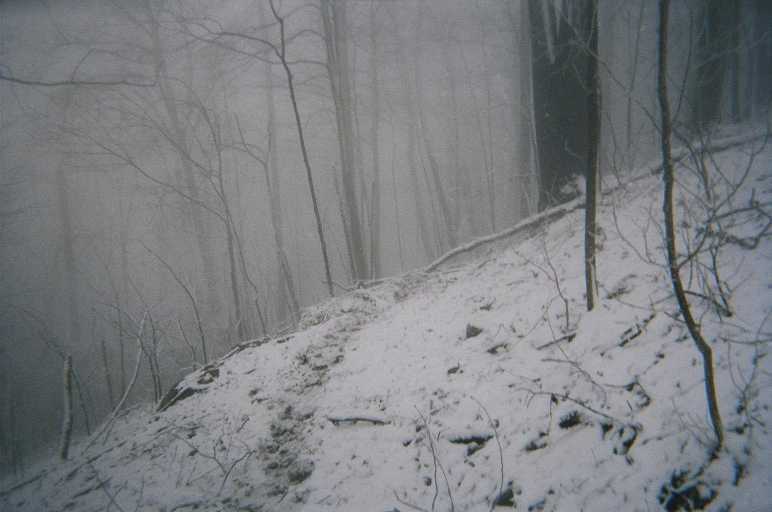 Starts at 9400 ft. 5500 ft. of climb over trails, some snow. 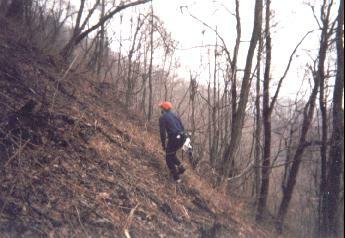 33,000 ft. of climb at 7700 to 14,048 ft elevation with snow, waist-deep river crossings, and 45 degree slopes. No crew or drop bags, but did have a pacer for 3 miles at the start of the second night. Had a bad cold left over from Hardrock and dropped at 13,100 ft. Mosquito Pass after climbing from Leadville (10,152 ft), 13 miles in 4:40, still had to walk back 8 miles in 3 more hours. Second place overall. Ran miles 8-22 barefoot in soft sand, rest in aqua slippers. Calves sore for several days. (Formerly the Penultimate Blue Moon of the Millinium). Ran last 10 miles barefoot in 1:45. 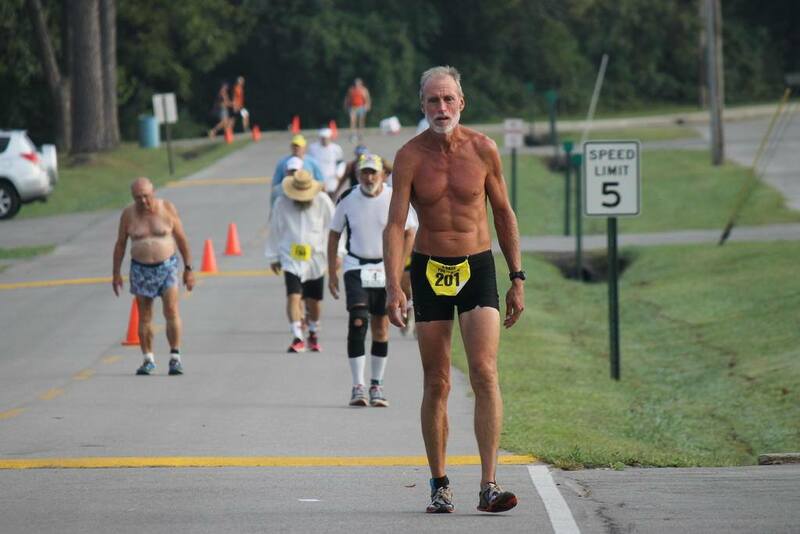 Won the "youngest runner" award at age 44. Joan ran the 50K on 9:35. Quit at Coffin Springs on loop 2 at 3 AM because it was 40 F and raining and windy and I didn't have enough warm clothes. Ran 28 miles (plus 7 back to camp) in 19 hours. Ran 90 miles in 97 F heat (50 + 40 in 2 days). 32'nd of 118 starters and 60 finishers. Ran as a training run for Nolan's 14 with no crew, pacer, drop bags, or socks. About 68 miles and 30,000 ft. of climb in 55 hours, 2'nd place of 6. 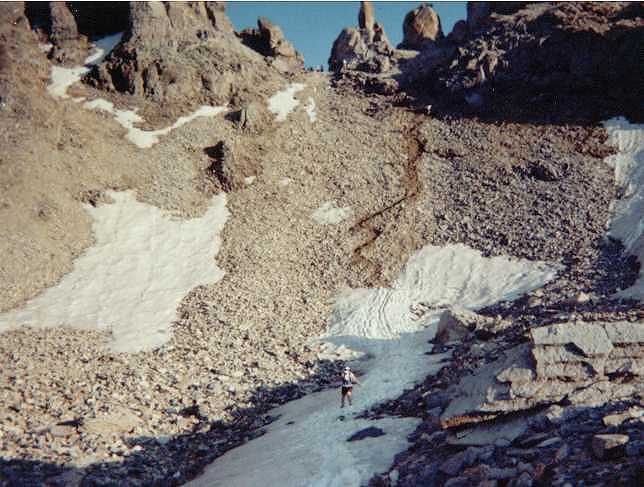 Nobody finished more than 11 of the 14 summits over 14,000 ft.
Eric Robinson descending the east basin of Mt. Huron, 14,003 ft.
A PR - ran in sandals to finish third overall. My first ultra win, but hey, there were only 3 runners besides Joan, who ran the relay division with me. (She ran the second half, and there were no other teams, so we won that too). 40 miles and 20,480 ft. climb in 29 hours, missing the 26:40 cutoff. Ran 43, 36, 30, and 11 miles on 4 consecutive days. The heat finally got to me on day 4 and I could not go on. Headed towards Mosquito Pass at 13,150 ft.
Oscar's Pass in the distance. Missed the 60 hour cutoff on Princeton (summit #11) and got lost during the descent on the third night. Made about 80 miles in 64:26. 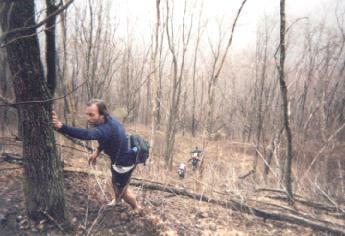 Exploring alternate routes in training on Mt. Princeton. 90 miles before the 32 hour cutoff expired. Started with a sore calf muscle and not enough sleep. On the beach. Ran barefoot for 23 miles, and the rest in aqua joggers. Soft trails. Ran about 15 miles in sandals, 5 barefoot, and 30 in old racing flats. Temps in high 80's, 63% finish rate. Ran out of time after 40 miles. Cold rain and snow, 25 miles in 19 hours. 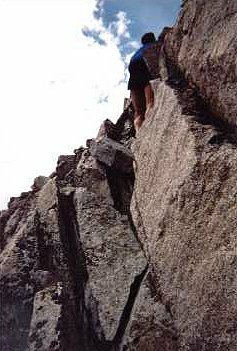 Steve Simmons climbing Rat Jaw. Ran 50 in 12:14 on day 1, then 19 on day 2 and quit. 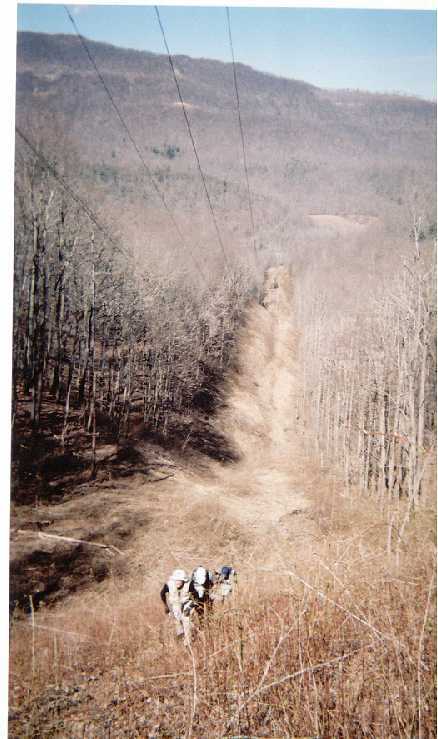 High was 90 F.
Descending the Powerline road from Sugarloaf, 11,200 ft. Finished second out of 19 starters and 9 finishers in nice weather. 40 miles in 28:37, 2 hours over the cutoff. 50 miles in 11:51 on day 1 (91F, dewpoint 68F, sunny). 30 miles on day 2 in 10:18 (99F, dewpoint 73F, sunny). 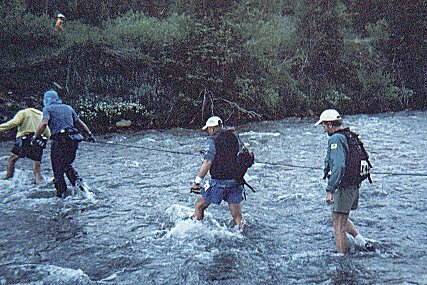 South Mineral Creek, 98 miles to go. 7th. About 1/2 mile of 1 foot deep water on the course. First male, but didn't win. Quit after 1 loop (20 miles) in 13:14. Weather was rain and snow. Ran 50 miles on day 1 in 12:27, and 11 miles on day 2. Made it to Ouray (58 miles) in 26:38 (8 minutes over cutoff). Formerly known as the Croom Trail 50K. 20 miles in 15:56, missing the 13:20 cutoff. 45 miles in 11:54. It was hot. 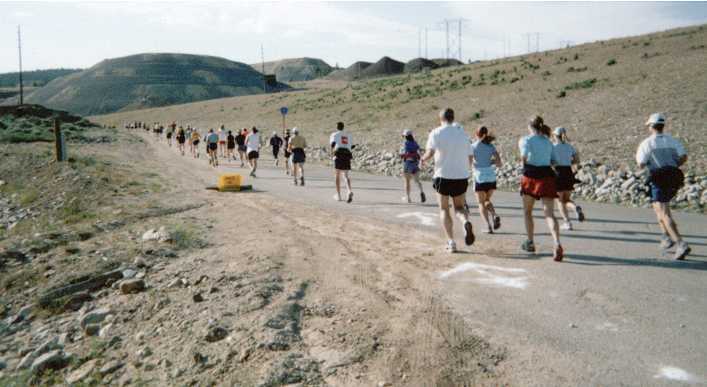 Also the Copper Mountain marathon on 7/9/06 in 4:49, but these aren't really ultras except for being on dirt roads at high altitude. The start at 10,200 ft., lowest point in the race. 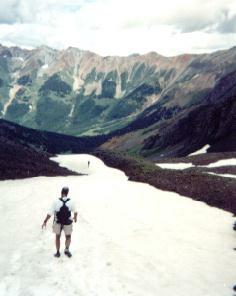 13,000 ft. Virginius Pass in a dry year. Got to the start 14 minutes late and missed second place (or first male) by 7 minutes. Finished second out of 11 starters and 5 finishers. The race is a clockwise loop on the levee around the lake, flat, 83 miles of pavement and 35 miles of dirt roads. Ran PRs at 50 miles (8:50) and 100 miles (about 20:50), but I hadn't trained for the last 18. Photo by Sandra Turner. Left to right: Richard Sitter, Joseph Ninke, John Turner (won in 25:28), Matt Mahoney (2nd in 26:55), Mike Melton, Thomas Moore, Trishul Cherns (3rd in 30:35), Stu Abcug (4th in 30:57), and race director Scott Maxwell (saying "go"). Three others started early. Quit after 30 miles in stage 2. Missed the 48 hour cutoff by 28 seconds. 6'th of 74 starters and 59 finishers. 4'th of 20 starters and 9 finishers. 75 miles on a hot day. One 20 mile loop in 12:17.
plus 37 miles in stage 2. 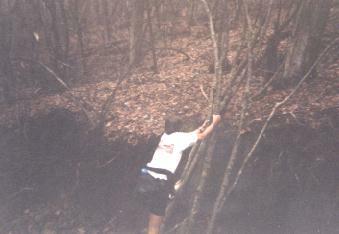 Climbing the easy side of Grant-Swamp pass. Actually 32.5 miles due to bad navigation. Stage 1, 50 miles in 12:13. Stage 2, 22 miles. 82 miles in 39:02, cutoff was 39:00. Nobody finished, but I went the furthest at 23 miles. 10'th of 74 runners. Heat index was over 100. Splits. Went out fast and paid later. 20 miles in 16:18, about 3 hours over the cutoff. 50 miles in 12:16 on day 1, 18 miles on day 2. South side of Hope Pass. Fourth overall and first 50-59. 50 miles in 10:45 on day 1, 30 miles on day 2. 50 miles in 14:20. photos. 8'th of 71 finishers, first 50-59. And 18 miles on day 2 in my 100 and 200 mile DNFs. 13 x 2.45 miles around Lake Baldwin, Orlando on a flat, paved path. In spite of my disappointing time I was still FURst overall. 60 miles in 18:50, cutoff is 17:45. Same 13 x 2.45 mile paved loop as the FURtive 50K. Finished first out of 43 starters. 2 pages (4 miles) in 11:07.
and 26 the next day for a 100 and 200 mile DNF. 8 minutes late to Hope Pass (44 miles in 12:23). 1 mile paved loop. Run your age in hours. 14th of 163. 100 in 36:26.